There are writing-related things that I’ve been thinking about, and want to write about. These are not them. Still, cool and interesting links for people who like words and stories and so on. This is just pretty: periodic table of typefaces. I like fonts. Interesting that Helvetic is in the Hydrogen position and most of the more commonly used fonts are near the top… if I had paid more attention in OAC Chemistry, I might be able to draw some conclusions. I like Pixar. I think they tell good stories. 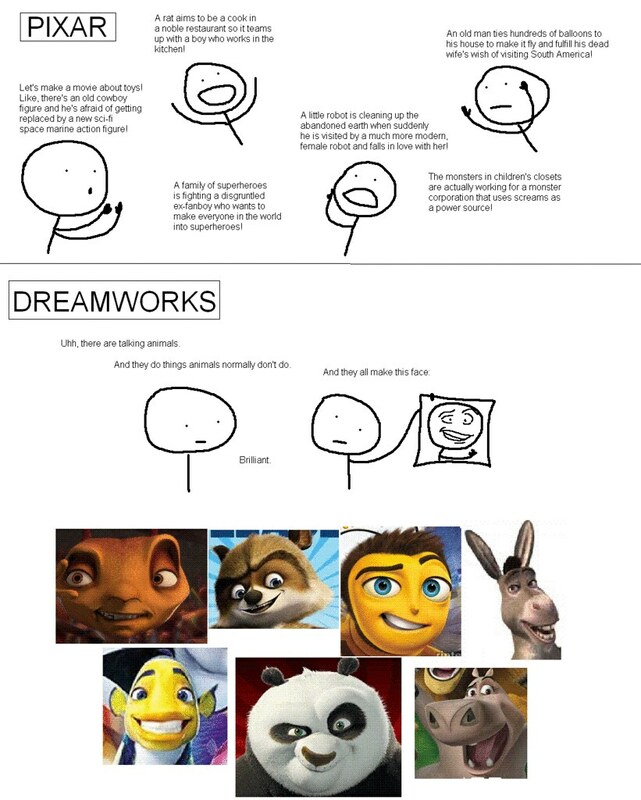 This little cartoon takes a dig at Dreamworks, which may not be entirely fair, but I like it for another reason. In my Writing for Children class, we’ve talked about picture book manuscripts. I think they’re one of the most difficult forms of children’s writing; fun to read but hard to write. Apparently that’s not the general consensus, though. Because they’re short, people expect them to be easy. It’s very easy to write a bad picture book. The talking-animal-for-the-sake-of-talking-animals scenario is a classic bad setup for a bad picture book. When I read the cartoon, I replace Pixar with “good picture books” and Dreamworks with “bad picture books”. If I come up with a catchier way to phrase that, I’ll let you know. Then again, if I could do that, I might be the sort of person who is qualified to write picture books. This is a New York Times article on the lost art of reading aloud. My husband read about it on Neil Gaiman’s twitter (tweet?) account. Not sure what the proper phrasing around that is. I’m a big Neil Gaiman fan, though, so it almost makes me want to jump on the twitter-y bandwagon. Almost. Not quite. Reading aloud… I like the idea of people getting together for that, but somehow the idea connects, for me, with the Jane Austen drawing room. I just don’t know anyone who does that and never have. I read to my daughter, of course–every night, and often during the day. Today she was reading board books to her younger cousin. I felt very proud. And sometimes, when I’m being very conscientious, I read my own writing aloud in order to edit it. I always feel terribly self conscious doing that. I think the article makes a good point, though, about work being experienced differently when it’s read aloud. It’s a shame we don’t do that more. And yet, I just can’t see it happening. I’ll keep reading aloud to my daughter as long as she’ll let me, and listen to her read aloud whenever she will, and hope to pass the habit along to her.